It was another very busy Saturday at CCFC with six sections. The top section featured all masters. 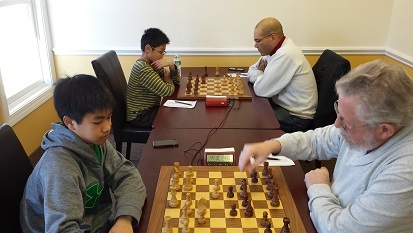 FM Leif Pressman and NM Nicolas Checa drew in the last round which tied them for first in the top quad with a 2.5/3 score. In the second quad Alan Price won his section with a 2.5/3 score. Maximillian Lu swept quad three with a perfect score of 3/3. Quad four was one of our more interesting sections of the day. 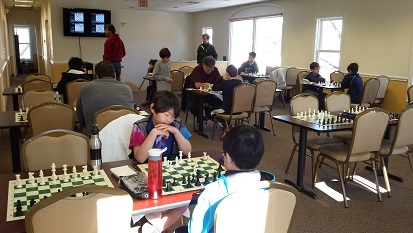 Despite a second round loss, Leo Bykhovsky emerged as the sole first place finisher with a score of 2/3. Brent McCreesh took first place, with a perfect score in quad five. 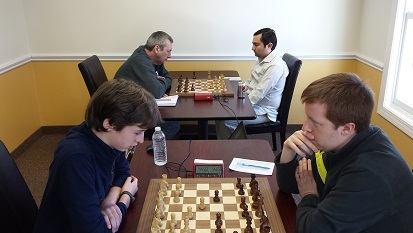 Nathaniel Moor won our bottom section winning all three of his games and gaining over 140 rating points. Thank you to all who participated. Hope to see you all next Saturday!